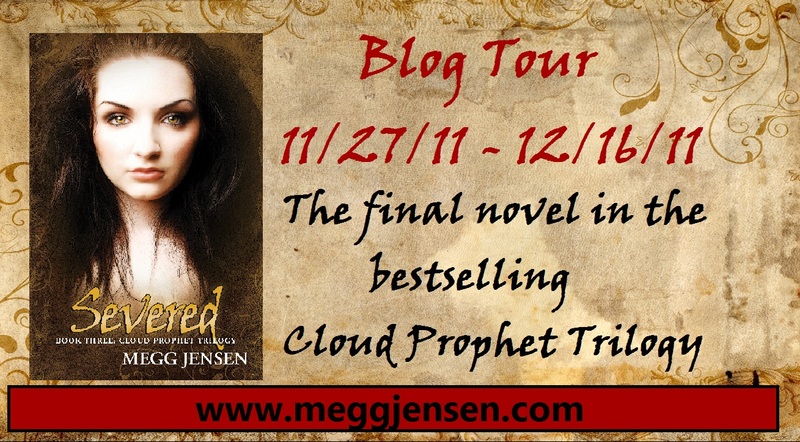 Hey welcome to our stop on the Severed Blog Tour! 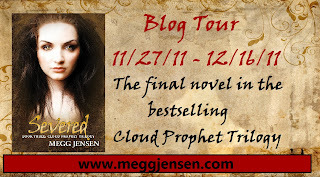 We are as always elated to host the awesome Megg Jensen on our blog and we have a really cool excerpt from Mark’s POV! We here at Two Chicks have always wanted to know what went on in that adorable head of his ;) so before that here’s a synopsis from the third and final book in the Cloud Prophet Trilogy! If I hadn’t seen it with my own eyes, I wouldn’t have believed it myself. The way she floated in the air. I hesitate to say possessed, even though that’s exactly what it was. Kandek was looking for her and, as a military recruit, it was my job to find her. Finding her hiding under Johna’s counter changed my whole outlook. As an undercover operative from the Sons of Silence, I considered it my duty to find this missing slave and return her. Not only would it demonstrate my commitment to the military, it would show my officers that I was trustworthy. The Sons needed someone like me to play the part and finding the missing slave was an easy way to gain position. That is - until I met her. I loved Reychel immediately, and irrevocably. After crawling out from under the counter, her wig askew, she stood in stark contrast to Ivy. Most guys would gravitate toward Ivy, gorgeous, polished, and obviously full of herself. Not me. The two of them standing side by side - one, an enduring star, the other like fleeting fireworks - it wasn’t hard to tell which one was the real prize. And now...wow, now. She’s the Prophet. It’s not just a small group of us that knows, everyone believes it. Malborn, Serenian, they all know the truth now. No one else has ever been graced by Eloh in that manner. I’m not afraid to touch her or kiss her. My only fear is, will she still love me? Am I enough for her? I’m willing to offer her everything, but will she accept? Awesome right?? Now you can all own book one of the trilogy Anathema! If you’ve already read the first two and want to buy Severed here are the links to Amazon, Barnes & Noble, or Smashwords to purchase it! Ahhhhh!!! I love reading Mark's POV!